Maybe tourists want to see Santas play slots. Or maybe they crave colored lights beyond their home Christmas trees. Whatever the tourist draw, two online travel companies list Las Vegas as Americas top Yuletide destination. Expedia, a Bellevue, Wash.-based online travel booker, earlier this week ranked Las Vegas as America’s second-most-popular U.S. air destination for Dec. 18 to Dec. 31 and its most popular hotel destination for Dec. 18 to Dec. 25 bookings. Also this week, Switchfly, a San Francisco-based travel-software company, on Tuesday named Las Vegas as its top domestic Christmas Travel Booking Index destination. Las Vegas also topped the gauge in 2014. Local tourism officials would probably welcome a Christmas boost; December has historically been a slower month for visitation. 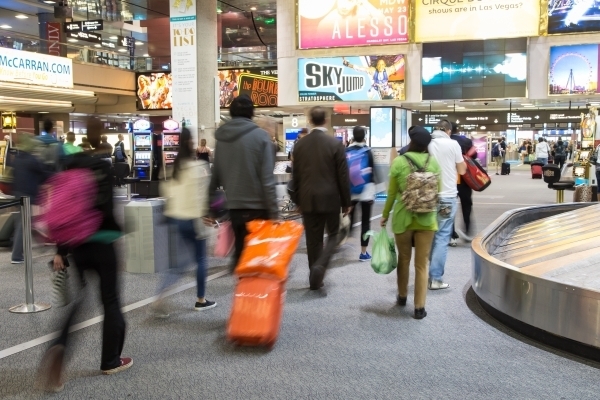 In December 2014, Las Vegas drew 3.12 million tourists, the fewest of any month all year, Las Vegas Convention and Visitors Authority data show. If December, which isn’t over, and November, which isn’t counted yet, bring the 6.4 million people they did in 2014, Las Vegas will cap a record tourism year. Convention authority data show that through October, Las Vegas 2015 visitor count was 35.7 million, 5.5 million shy of 2014’s record 41.1 million visitors. Expedia spokeswoman Ingrid Belobradic suggested Las Vegas may yet benefit from procrastinating deal hunters. There are always a few last-minute bargains, she said. “What we tell people is, if they see a good price, they should book it,” she said Thursday. Travel industry analyst Henry Harteveldt of San Francisco-based Atmosphere Research said Wednesday that hes not surprised that Las Vegas topped the Christmas travel lists. He said the city has always been aggressively marketed and dominated by low-cost carriers including Southwest, Allegiant, Spirit and Frontier. Also, he said, Expedia and its ilk are master mixers. By buying flights and hotel stays wholesale and selling them together in packages, Expedia and Orbitz can offer prices lower than consumers might see advertised or than they’d pay for the items separately. Orbitz, in its Insider Index, published in November, and Expedia, in its Holidata analysis from Monday, say airfares have dropped from a year ago, something Harteveldt and other analysts corroborated, partly because of lower prices for oil, a key component in jet fuel. Orbitz, for example, said holiday season airfares are down 9 percent from a year earlier; Belobradic said Expedia sees a 7 percent drop. San Francisco-to-Las Vegas fliers, she said, are paying 30 percent less for tickets on average than last year’s holiday season. Cynthia Harris, a AAA spokeswoman for Nevada, said Wednesday that consumer confidence is up and gasoline prices are down, which may push more visitors toward Las Vegas by air and car. Orbitz said Americans are budgeting more for holiday travel, earmarking $2,195, up from $2,177 in 2014, a 0.8 percent increase. With lower airfares and hotel prices remaining relatively flat, Orbitz said, those budgeted dollars will go further. Britt Beemer, founder of Charleston, S.C.-based America’s Research Group, a consumer research company, on Wednesday said that even small ticket-price drops can spur travel. Ten dollars off each way on a round-trip would save a family of four $160. Las Vegas may benefit as a holiday destination because unseasonably warm weather has ski resorts suffering, Beemer said. Recent news reports say higher-than-average temperatures delayed or hampered ski slope openings in Vermont, Pennsylvania, Michigan and Illinois. Switchfly CEO Daniel Farrar suggested weather helped Las Vegas top his company’s Christmas travel list, which tilts toward the sunny. His company listed Orlando, Fla., and Miami among its top five U.S. Christmas travel sites and Brazil and the Bahamas among its top five foreign sites. Also, he said, Las Vegas is easy to reach, generally affordable and fun. Belobradic agreed with Farrar about Las Vegas broad appeal. Airline industry analyst Robert Mann of Port Washington. N.Y.-based R.W. Mann & Co. wasn’t sure Christmas travel should be isolated for analysis. Passengers fly all year for other holidays, he said Wednesday, and airfares and seat availability hinge not on calendars, but economics. If airlines can’t profit, they won’t fly.